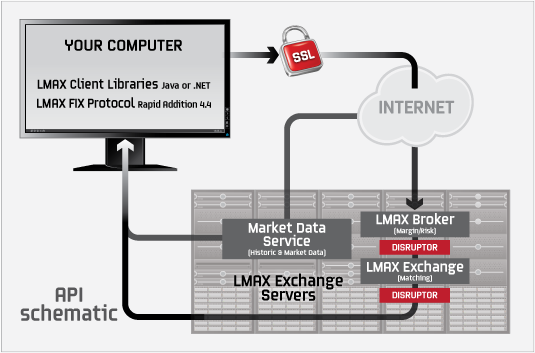 LMAX Global Application Programming Interface (API) technology enables clients to automate FX trading and CFD trading. With messages available in XML/JSON format clients can either choose to develop their own wrapper or use LMAX Exchange customisable Client Libraries (Java, .NET) or LMAX Exchange FIX protocol to simplify the integration. otherwise flat fee of $75 per month. Enter into a license agreement with LMAX Global – LMAX Global API Agreement (PDF). Have access to the expertise to implement complex computer programs in the supported languages. Understand you will be charged an inactivity fee if the minimum trading thresholds are not met.